The one arm chin-up and one arm pull-up are difficult skills to obtain. Depending on your starting strength, it may take you 6 months to several years to get the skills. Below I’ve written out the techniques and progressions I used to get mine. Feel free to use what parts you need. You may also want to check the one arm chin articles on the Dragondoor page, especially the guide by Jack Arnow and Alexander Lechner. Take a look through to read up on other techniques and tips that you may find helpful. NOTE: It appears Dragondoor has taken down both articles, as of February 2018, you can read the articles on this forum. If you are looking for a good, easy pullup bar for your place. Check out the doorway pullup bar from RubberBanditz. The extra semi-circle handles are great for hanging rings! I highly recommend you switch up between different hand positions in order to build strength in all the different pulling muscles. Because there are only minor differences in training a one arm chin-up and a one arm pull-up, I often use “pull”, “chin”, “OAC”, and “OAP” interchangeably. That is, if you see “OAC” you can read it as “OAC or OAP”. If there is a specific exception to this, I will make a note of it. If something is confusing, let me know. I’d call this a one handed chin-up, as you’re still using two arms to pull yourself up. If your grip was strong enough, you could do as many of these chins as you could your regular two handed chins. If someone ever says “A one arm chin? That’s easy, I’ve done 15 in a row!”, then they’re probably talking about this skill. If not, stop reading this article and find out how they trained. Concentric – This is where your muscular force is greater than the resistance it is facing. In this case it’s when you pull yourself up to the bar. Isometric – This is where your muscular force is equal to the resistance it faces. This would occur when you hold a position on the bar. I’ll often refer to this as a hold or lockoff. Eccentric – This is when your muscular force is less than the resistance it faces. With our particular situation, this would occur when you lower your body UNDER CONTROL. I’ll often refer to these as negatives. In terms absolute strength, you can handle the most weight with an eccentric movement, then an isometric movement, then a concentric movement. Keep this order of strength in the back of your mind. Equipment – Rings, Bar, or Other? The most popular choice for working towards the OAP will probably be the bar. It’s easily accessible and familiar for anyone whose ever had a pull-up test in gym class. Some may wonder whether doing these one arm pulls on rings would be better for the elbows. 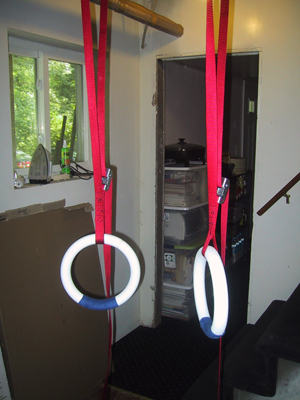 I feel it’s unnecessary to use the rings, and that it may be detrimental since it takes away the practice of balancing the body on the bar and controlling any twisting motion. Some may still argue that working an OAP on a bar will give you elbow tendonitis or some other problem. I offer own personal experience – I worked exclusively on a bar for the one armer, and only experienced tendonitis when I got overzealous with repetitions during a training session. My injury came from a flaw in my training program, not my training equipment. If you are working this for rock climbing, or simply want a change in routine, then I would recommend working on some rock climbing holds or a ledge. I’m not starting a debate over the usefulness of a one arm pull up for a rock climber. I’m simply making a note for those to whom this may apply. Oh yeah, and doing one arm pulls on metal beams and porches is a lot of fun. While the inevitability of elbow tendonitis may be debatable, his treatment his spot on. If you find yourself with signs of elbow tendonitis (acute ache in the elbow joint), stop all chin up work until it heals (which may take several weeks), then start slowly back into training. In order to avoid the problem entirely, I would recommend progressing slowly, especially when you start working the harder one arm exercises. Listen to your body and don’t hesitate to back off of training if you suspect elbow tendonitis. I also kept my repetitions very low for one arm work, something I’ll elaborate on in the training regimen section below. Shoulder Pain – The shoulder is the other joint most likely to be strained while working the OAP. Anytime you find yourself hanging at the bottom position for any of the exercises (one or two armed), make sure to keep your shoulder pulled TIGHT into the socket. It can be dangerous to relax the shoulder when so much weight is being applied to it. Before you start working toward an OAC, it’s important to have a base from which to work from. I would recommend being able to do at least a dozen chin ups easily. Increasing your two armed chin-up number will help promote muscular hypertrophy and prepare you for the specialized strength training to come. If you are a bit low in numbers, you can work on increasing them in any number of ways – ladders, greasing the groove, etc. At this point, you may ask yourself if it’s possible to simply focus on increasing your two arm chin numbers and then one day jump up and do a one arm chin. If this is even possible, I feel it’s the most inefficient way of getting the skill. Working on increasing your max chin-up numbers will increase your max strength up to a point, but with too many repetitions you are simply working on muscular endurance. The OAC is a skill that requires training your max strength. It would make as much sense to do hundreds of pushups, then expect to bench 400lbs (~180kgs). Since we need the strength to pull ourselves up with one arm, our training should eventually focus on building that strength. The grip is important for an OAP because a strong grip on the bar will allow one to maximally contract the muscles of the upper body. If you are struggling to just hold onto the bar, it will be very difficult to coordinate the rest of your muscles to pull you up. If you find your grip lacking, here’s one way you can strengthen it – captains of crush grippers. These are high tension spring grippers that can take hundreds of pounds of force to close. I’m able to mash my #2 gripper right now, which takes approximately 195 lbs (88.4 kg) of force to close. Since I weigh about 160 lbs (73 kg) right now, it’s easy to determine that my grip will not be my limiting factor. If you decide to pick up some of these grippers, head on over to the gripboard, which will give you more information for training than you could possibly imagine. You can also get a great workout for your hands with just a couple towels. Throw them over your bar and grab them for chin ups. Another method of working your grip for this skill would be to simply practice hanging from a bar by one arm. When doing this, make sure that your shoulder is tight into the socket. For the first exercises involving two arms, I would work the exercises into my routine just like any other back/biceps exercise. For your reps and sets, I would keep both low. Generally I was doing 3 sets of 4-6 for these exercises with adequate rest between sets to recuperate. For some of the weighted chins, I might go even heavier with the weight and knock the reps down to somewhere around 3-5. Whatever rep/set scheme you decide, stop before you hit failure. For the one arm assisted exercises, I started decreasing the total amount of repetitions, as the stress on one arm increased. When you first start doing one arm chins especially, keep the repetitions very low. I might do 3 sets of 2, or even less. I found working specific one arm exercises one or two days a week, interspersed with days of weighted two arm exercises to work for me. And as I mentioned before, watch for signs of elbow tendonitis and don’t hesitate to back down with training. With a decent number of chin-ups under your belt, it’s time to start stressing the arms further. I started with concentric exercises with two arms before I even thought about jumping onto one arm. The weighted chin was a major exercise I worked on while training for the OAP, much more important that doing endless unweighted chinups. I would highly recommend you work this exercise. This was my bread and butter. Power chins were never something I built an entire workout around, merely an exercise I performed a couple times at the beginning of a workout when I felt fresh. Simply hang from the bar with arms straight, then try to pull yourself up to the bar as fast as possible. This exercise will teach you to contract your muscles strong and fast in a way that I found similar to the start of an OAP. In this exercise do a chin up to the top of the bar, hold for several seconds (I used 5 seconds), lower down completely, chin to a 90 degree arm angle, hold for several seconds, lower down completely, then chin to a 135 degree angle to hold for another several seconds. This is one “frenchie”. The reason you’ll need to hit three different positions (top, middle, bottom) is so the isometric holds can stress the muscles for the entire range of motion. The frenchies will stress your arms a great deal in just a small number of repetitions. This is also an excellent exercise to start weighting when things get too easy. Before we talk about specific one armed exercises, I felt it would be helpful to talk about the position you’ll find your body in while hanging from the bar. When going either up or down on one arm, I found it useful to keep the pulling arm close to the body, so that the upper arm came in contact with the side of the body (lats and stomach) as much as possible. This allowed me to fully utilize both my arm and back when pulling up to the bar, or controlling my decent. As for the rest of the body, I mentioned before about the importance of grip strength in performing an OAP. A strong grip will allow you to fully tense your entire upper body when pulling. You may also find it useful to tense your free hand into a fist, as well as tensing your abdominals during one arm exercises. While specifically performing a one arm chin, I came to notice my body would always turn away from my pulling arm, so if I was chinning with my left arm, my body would turn clock-wise. To counter-act this turn, and keep my pulling arm close to my side, I found it useful to cross the free arm over the front of my body, or in the very least keep that free arm close to my side. This, in combination with a slight twist of my gripping hand, helped keep me from going all over the place when pulling. As you can see in the picture below, I try to keep my body facing forwards during the OAC. This has always felt like the strongest position for me. You can see the differences with the OAP in the picture below. My body tends to twist into the bar. As you progress well with the two arm exercises, you’ll want to start testing yourself on one arm exercises. When trying your first one arm chin, I’d suggest finding a bar that is just within your reach when you stand on the ground. Freehanging from a bar then pulling is something you should eventually work for, but when you first start working OAPs it’s only going to tire you out for your max effort. Try a one arm chin. Try it from the bottom of the pull. Try it with your arm at a 90 degree angle. Do you see where your weaknesses lie? Perhaps it’s everywhere. Don’t fret. I found it helpful to test myself every couple weeks in order to see where I stood with the skill and what I needed to work on. I also find it important to note that when you’re pulling, engage both your back and your arm muscles very quickly and very strongly. I think of not only flexing my arm, but pulling and rowing with my back. There’s two angles on your body that you’re looking to decrease. Since we’re ultimately trying to get a concentric movement with one arm, I felt that assisted concentric movements were great to work on. Not only for the added stress on the arm, but to find the groove of the OAP. If you find you have difficulty pulling out of the “hole” at the bottom of the OAP, these exercises should help. This is a great exercise and it has the added benefit being able to quantify the amount of assistance. First, get about 10-12 feet (3-4 meters) of rope. I picked rope that was 1) comfortable to grab, 2) strong enough to withstand the pulling, and 3) a rope that DOES NOT STRETCH. If you pick up some rope, check its characteristics to make sure it does not stretch. I believe I picked polyethylene, but don’t quote me on that. Next, take the rope and tie one end to some weights and throw the other end over your bar. It helps if you have a slick bar, or you could even rig up a pulley. The point is to minimize the friction between the rope and the bar. How much weight should you use? Well I wouldn’t do this exercise if you have to tie anything more than 25 lbs (~11 kg) onto the rope. I highlighted the weight in the picture below because it was a bit difficult to see on the basement floor. Anyways, what you have now is a simple device for assistance. Now the pulling arm will grab the bar and the assisting arm will grab the rope. As you pull up, you can pull down on the assisting arm to get you up to the bar. If the assisting arm assists you too much, the weight will rise off the ground and you won’t go anywhere. Due to friction, the amount of weight assisting you may not translate directly, but it will give you a clear show of progress when you decrease the amount of weight tied to the rope. Again, here is another use for a common bath towel. Throw it over the bar and grab it with your assisting arm. The lower you grab the towel, the harder the pullup will be. This exercise is decent, but you’ll probably find that your assisting arm can still help a bit, even when you’re pushing downwards with it. Using the fingers of your assisting arm to help pull is useful for stressing the pulling arm, but it is very hard to tell how much the finger is assisting. Even still, you can try working from four fingers to three to two … to your index, middle, pinky … then eventually to your ring finger. As I progressed with all these concentric movements, I eventually started working eccentric movements. Remember how the eccentric movement is the strongest? Well, if you can’t chin UP with your arm, you still may be able to chin DOWN. The name of the game is CONTROL. If you can’t do these unassisted one arm exercises under control, then don’t add them to your training. I also felt these exercises were excellent for working the top half of the OAP. They really gave me a good finish to my OAP’s. If you can stop your descent and lockoff your body during these exercises, then you’re one step away from the strength for the concentric strength to pull a OAP. It’s time to unweight yourself and work on one arm solely. How much weight should you be pulling in your two arm chins before you try these? I was pulling 100 lbs (~45 kg) for a strong double at a weight of 160 lbs (~73 kg) before I started really focusing on these one arm exercises. You may need more or less relative weight before you feel comfortable. Just listen to your body and don’t hesitate to put this exercise aside if you can’t control it. For the one arm negatives, I found pulling up to the top in an alternate grip, then releasing one hand to be the best method. Make sure your chin is above the bar when you start. Again, you should be able to lower down SLOWLY to the bottom. When you get stronger, add the isometric holds at the top, middle, and bottom. Start adding a small amount of weight (2.5 – 5 lbs, 1.1 – 2.2 kg) and work on a controlled eccentric movement. Continue until you can again lockoff at the top, middle, and bottom of the movement. After many training sessions, you’ll test yourself and finally get this skill. It may not be the prettiest thing, and you may feel like your head’s going to explode as you pull yourself up, but you’ll soon find your unexploded head above the bar. Congratulations! The road has been long. In the days following your first one arm chin, I found it helpful to do at least one OAP each day. You can decide how to fit this into your training schedule. I found doing this helpful not only for getting the body into the groove of the skill, but more importantly getting your own mind into the groove of the skill. For each subsequent OAP, your confidence (and strength) for the skill will increase, but at the beginning you may question yourself. Did I really do that? Can I do it again? Yes you did, and yes you can. If you do grab the bar in the following weeks and find the OAP is “gone”, don’t worry about that either. Continue diligently with your exercises and it’ll return. Continuing progression with the weighted chins will certainly help in building strength. I myself have focused a lot on one arm exercises. One arm weighted negatives with lockoffs make for a very intense workout. I have also draped ankles weights on the top of the bar, done an OAP, then grabbed the weight for a weighted one arm negative. Play around with the exercises I’ve given you, or feel free to create your own. As of the publication of this article, I’ve successfully pulled two consecutive OAPs with my left arm, and I’m working for consistency with that. Just remember to have fun with this and remember IT TAKES TIME. Don’t become discouraged in getting this very difficult skill. Thanks a lot for the advise. You weigh the same as me so that makes it easier for me to guage how much weight I’ll need. I am a climber and got to the 90 degree mark but quit and now I want to try again 12 years later. Thanks again for the tips. If it hurts, don’t do it. Do what you can do that doesn’t hurt. Rolling out the forearms and upper arms with a tennis ball/lacrosse ball or get a sports massage, and go see a doctor if you are really concerned. gd, you are strong, ha. i wish i had space for a free standing pull up rack. Um, yeah – there’s a picture of me doing it in the tutorial! What do you think about using stretch band instead of towel/rope? Works great too! Many ways to get from A to B on this one. I have a climbing background and have recently set out to accomplish the fabled one arm pull-up. What I have noticed is that my strength at 90 to 0 degrees is good. I can hold isometrics at these angles and can even do a OAP starting from the 90 degree point. This makes sense since climbing requires a lot of these types of static holds with one arm. Typically called a “lock-off” in climbing vernacular. So my question is what I can do specific to my situation to help with the lower portion of the rep? Awesome tutorial. As far as programming goes, how many times a week were you doing pull-ups and what did your reps/sets usually look like? Thanks in advance! Good article. But why are you wearing clothes? Hey, really nice tutorial, I have been working out for a year and a half now and I want to train myself to be able to do this with both arms..
I’ve been working towards this feat for over a year and a half, and managed to accomplish it earlier this week! It’s been tough, with a variety of injuries from elbow tendonitis to a broken thumb. Regardless, I could not have managed without the help of this guide. Thank you! For the weighted chin ups what percentage of your bodyweight were you able to chin for say 5 reps? I just want to know so I have a actual number to aim for on those. Also thank you for the tutorial. You can plug a 3rm into an online 1rm calculator and figure out the numbers. Great idea that I’ve used for rafter chin-ups too! YOU ARE AN INSPIRATION TO ALL OFF US. In my case (I am 58 almost) over minimizes the tendon stress (from finger/wrist extensors). hi , I APPRECIATE YOUR HELP ON THIS. I am able to pull out 15 two arm pull ups. and sometimes when i start off fresh …i am able to do a negative OAC. i am a skinny guy of 65kg..5’9…. Your help is appreciated. !!! Hey beast skills, I’m at the weighted pull ups progression & I’m using a cinder block which weights around 25-30 lbs along with 2, 8 lb weights, how many sets & reps should i be able to do before i add more weight? I’m doing 5 sets of 3 reps right now. Plus what percentage of my body weight should i be able to do with weighted before attempting the negatives? i weight around 175 lbs. You will quickly figure out how many reps you need before you add more weight. If you can’t do a weight, then you need more reps at the lower weight. I found 2/3 your bodyweight for 2-3 reps is good. So we’re looking at over 100 lbs added. I just wanted to say thanks for posting this excellent tutorial. I’ve been working on the OACU for a couple of months now by doing pinky assisted ups, and then slow negatives. More recently I was using a thin rope slung over the doorway bar, tied to a 10 lb chain for the assist. The chain starts out lying entirely on the floor. So I could tell I was getting close when only a few links of the chain came off the ground on the assist. I also focused on holding the top, middle and lower positions on the negative (like the Frenchies). So anyway, yesterday I felt like giving it a shot unassisted, and I GOT IT, one rep on each side. Still not starting from a strict deadhang, but it felt awesome anyway. Once I can do it from DH with better form I might post a youtube vid. Thanks and please keep making your great tutorials. The dead hang is quite hard. Work on really relaxing the shoulder, then pulling the shoulder into proper place during the assisted pulls. On the assisted OAC, then work on keeping the shoulder down and back for the entire duration of the exercise. Hi, great advice. I weigh about 217 and can see it will be much harder for me. I’m carrying honestly too much body fat so I want to get get down to about 195. At 217 pounds, I can do about 21 – 25 chin ups despite carrying too much body fat. I have always kept up with chins since the Marine Corps. I’m going to use your advice. I have never seen any man, except on YouTube, do an OAC. It is an impressive feat indeed. I could care less if a man can do a 700 pound bench press, but a man doing an OAC? That is truly special! Good job and thank you for the great advice! We all have things that impress us. The OAC is a great goal indeed, and with hard work can be achieved by many different types of people! Good luck! Considering this OAP Progression training is for both Left And Right Arns. Do I have two split the limbs into two different training sessions or I could do both arms in 1 training session? If I can incorporate both limbs ina a single training session. How muh rest in between arms should I take. Last but not the least, can I include this routine into a bodybuilding-type workout (more prioritized on definition and development since hypertrophy-specific routines would make the progression SLOWER due to increased body mass)..
Great tutorial, getting quite close now! Can do the top half unassisted, working on getting the full thing. Can I train for the OAC before learning the muscle up, back and front lever? I can do about 12 deadhang pullups, should i learn levers and muscle up first? Levers are not necessary, but a good mix. I would learn the muscle-up first though.